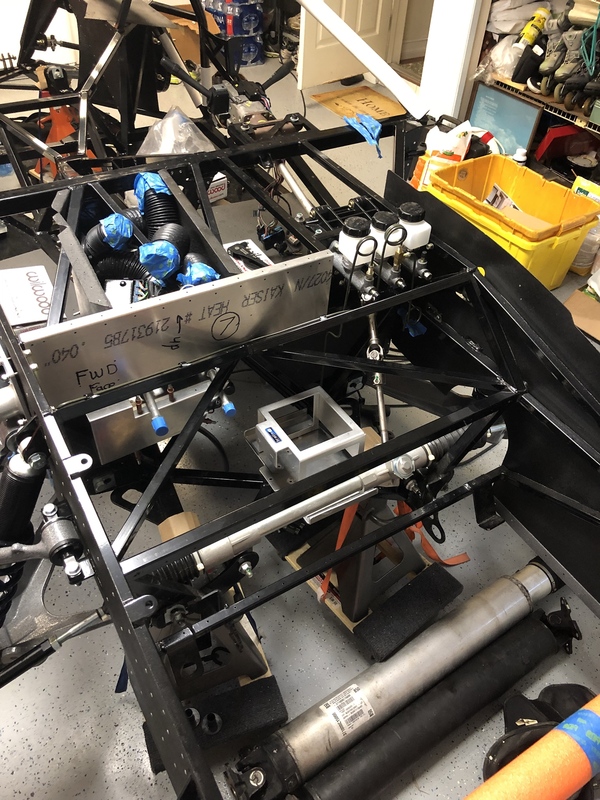 Dan confirmed the Wilwood Kit PN as the correct assembly for the GTM. Time to go to the fastener store. I'm off to CT for business, returning Friday, and hope to get into the brake lines when I return. Tools should be arriving at the house while I am gone. Looking forward to doing something new on the car. On a side note, I found a lead on the vacuum pump and bagging materials for me to tackle carbon fiber parts down the road. If I can get the price down a little, I'll have most of the expensive items I'll need to explore making some of my own parts. Yup, already did the mod from your other posts cautioning against it. I did learn that a rotary file on these parts is not a great idea. I had all kinds of splinters for days I had to pull out LOL. 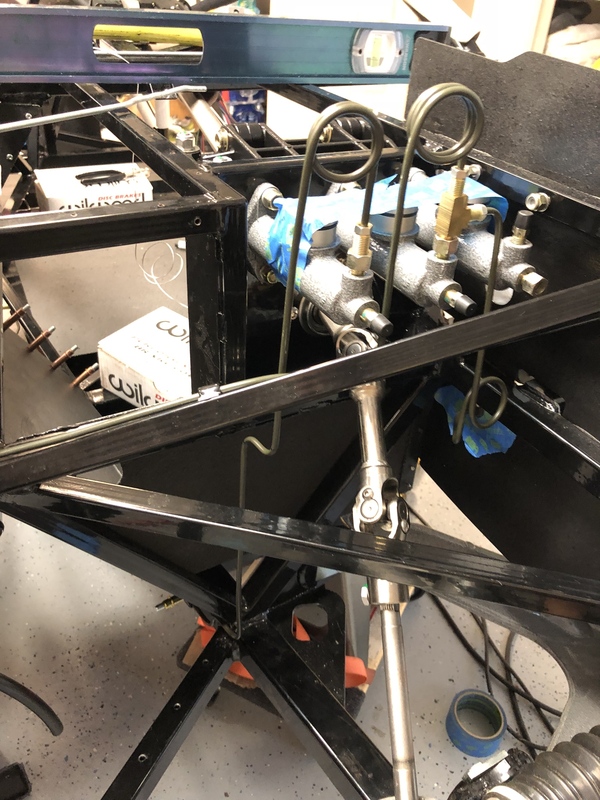 I have been reading around and saw one other guy grind away the horizontal, what look to be like mounting boss bolt holes, on the top side of the master cylinders themselves. 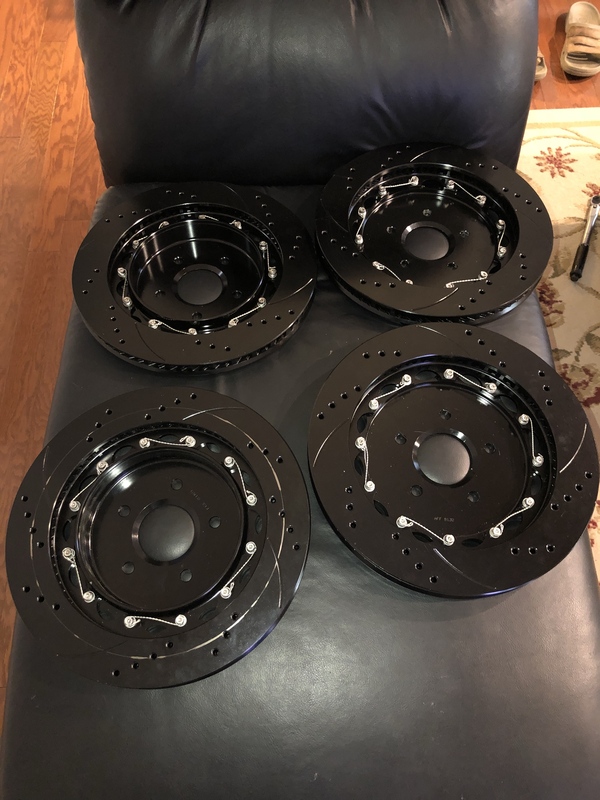 Looks really clean and then I'm thinking of having them powder coated to match my suspension (silver hammer tone color). Obviously removing all the internals and mask appropriately. Should turn out pretty slick. 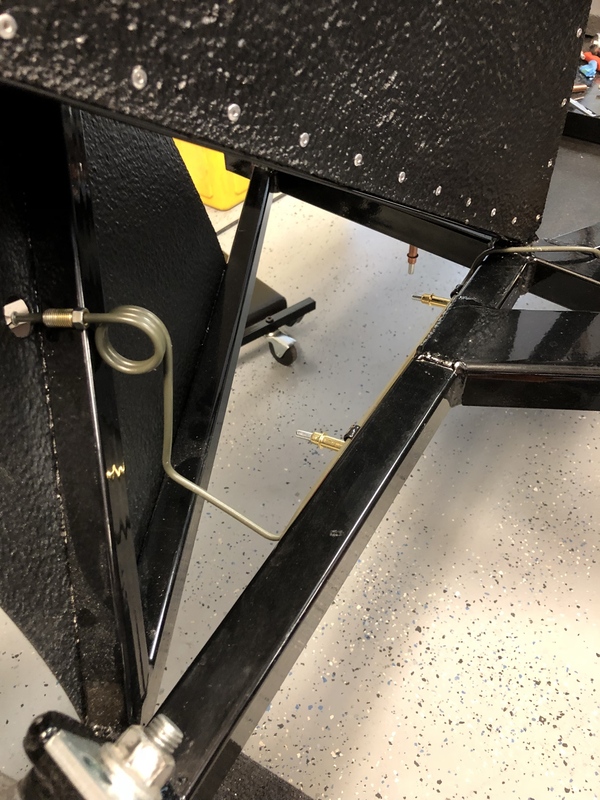 Yes.....I have learned to NEVER use a carbide cutter on any metal parts unless I have the shop vac hose right there at the cutter as I'm cutting so all of the splinters go right from the cutter into the vac. 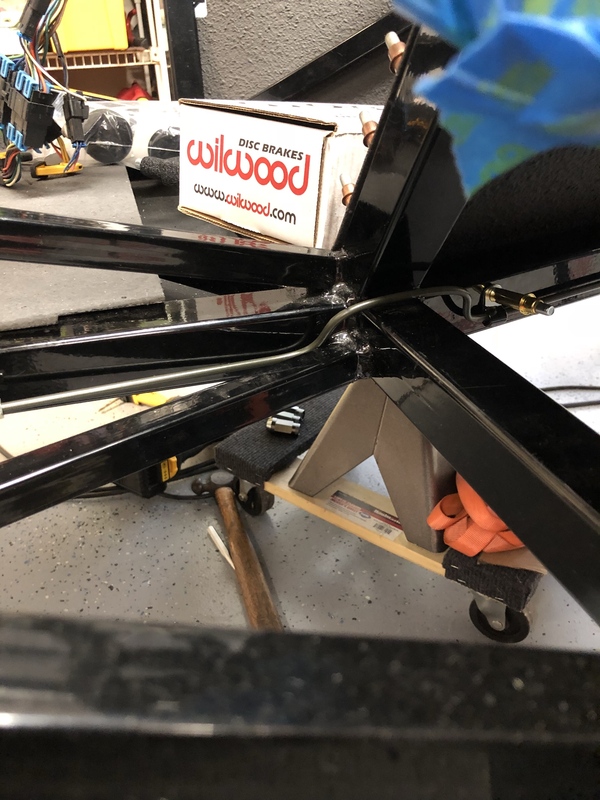 I came across a post some time ago about someone removing the bosses on the Wilwood Mastery Cylinders and I really liked the idea and it would give me another reason to visit my powder coater. Took a little time to do the first one, but after that I had a process set up and had the others done in no time. I removed all the casting gates and the master cylinders ended up round within 0.010”. Yes, I’m an engineer, and yes I strive for perfection. My dad taught me if its worth doing, do it to the best of your ability. Off to the powder coater they went, and I choose the same color as my suspension, Silver Hammer Tone. Minor delay getting the proper lube called out in the Wilwood rebuid manual, but ebay to the rescue. 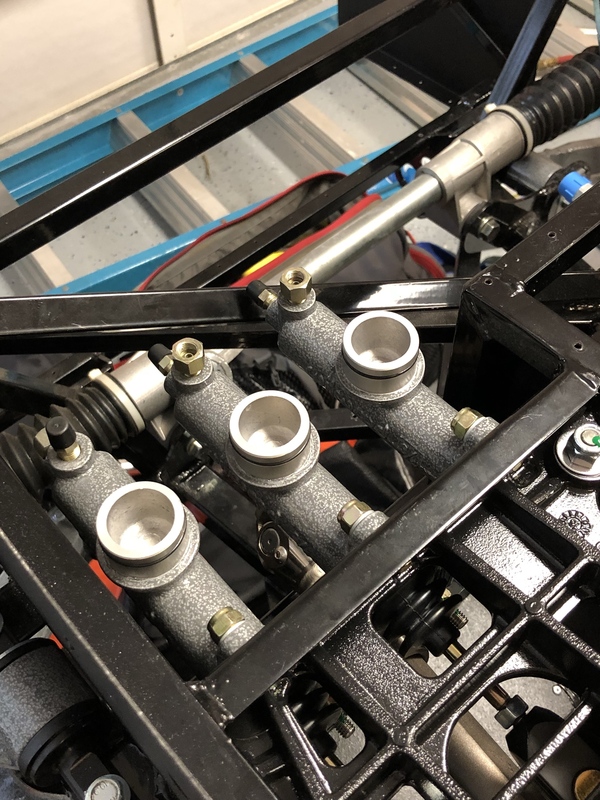 Fully rebuilt and ready to go into the GTM. I made sure I did Shane’s clearance on the clutch side, fits perfectly with no binding, and putting in a jam nut. 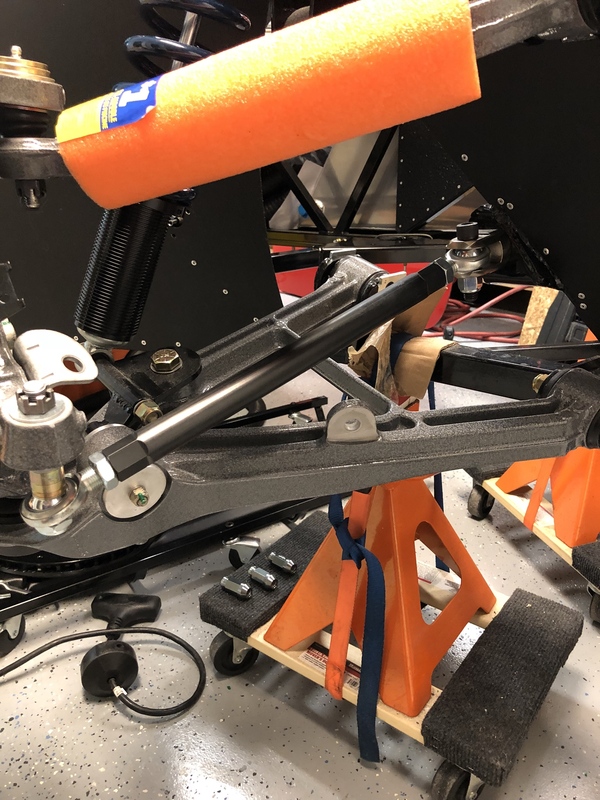 I threaded the push rods in fully and it seems the pedals are a significant distance from the firewall and the break and clutch pedals don’t exactly line up. Is this typical and will there be more adjustment down the road to line them up better? Little touches like that will make your build stand out in the end. Nice work. 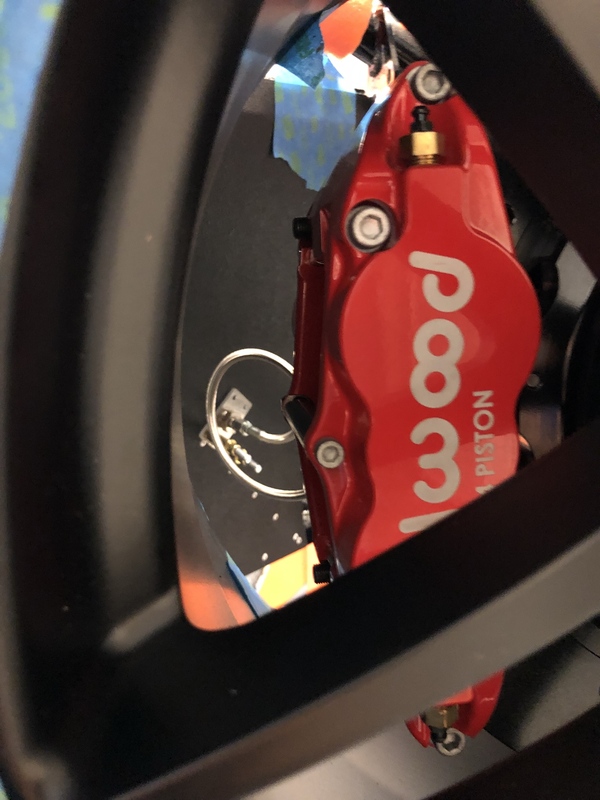 Have you made an adjustable clutch pedal stop yet? Thank you Sir!!! Not quite the master fab skills you have, but definitely the small touches that will make it stand out. I saw you are doing the roof scoop, have you watched this video yet? Absolutely!!!!! I have learned A LOT from these videos and found I needed to make notes along the way so I know what video to reference back to for different parts of the build. I'm up to Video 51 in the series and have com up with so many ideas. For the roof scoop I'm wondering if I can make a full carbon fiber replacement and create a "pocket" for it to drop into and still look good. 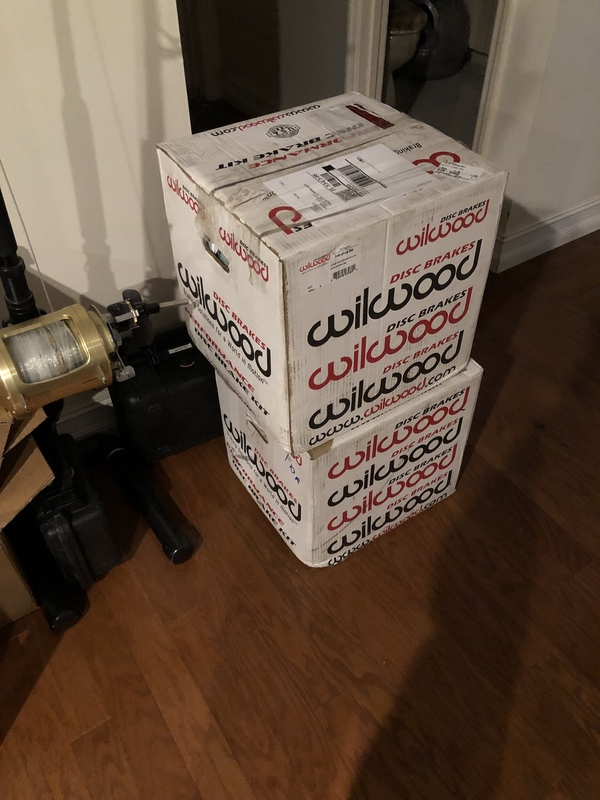 I picked up a barely used vacuum pump and some left over vacuum bag stuff from a local guy who built a new T-Top for his boat for a great price. This will be quite the upgrade if I can make it work. Use a double cut tool instead of a single cut and this problem will disappear. So I have been bouncing around in the garage on a few things, so I figure an update is warranted. I got my full Infinity Box setup in and have been playing around with ideas on where I really want to mount the cells. 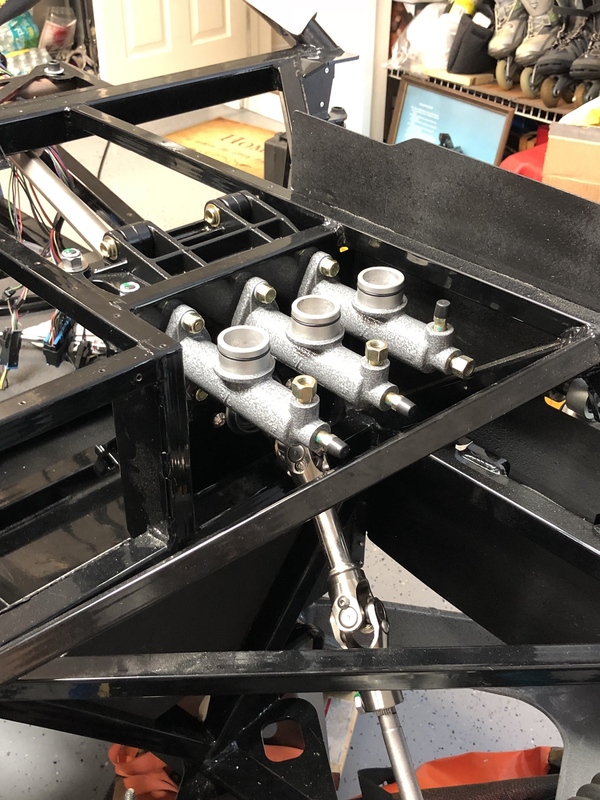 I’m not keen on the idea of laying on my back under the driver side to see the main cell, so this will likely find its way into the front compartment under the hood. Maybe incorporate some type of machined bracket to show them off nicely. 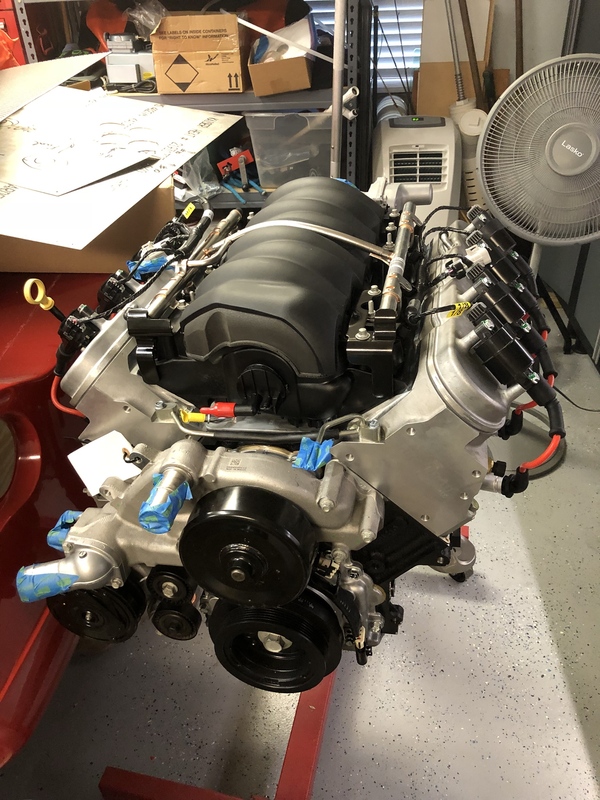 I have a local machine shop that has taken interest in my build, so I may throw some work their way and see what we can do. I will say, the cheesy plastic GTM badging will not be on my car. I’m thinking custom milled Titanium or Inco. All depends on what is laying around in the shop scrap bin when I get to the part. 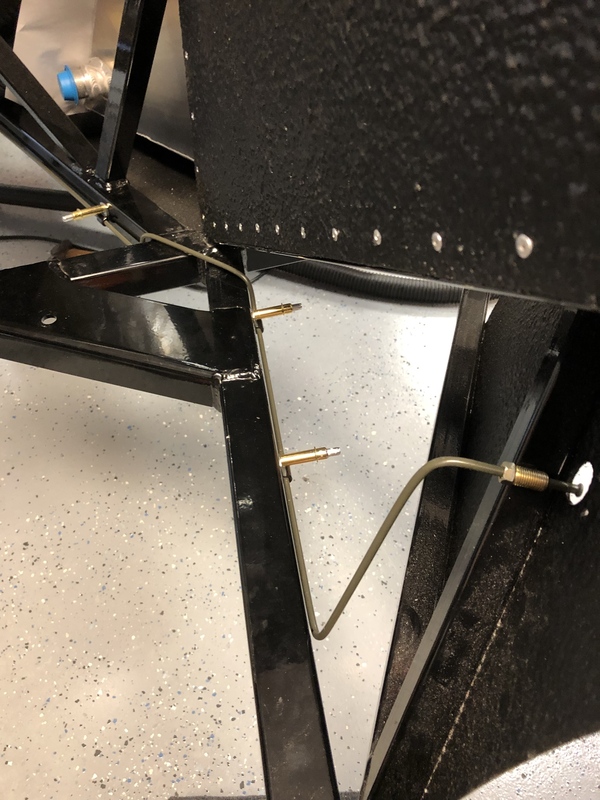 I have also been playing around with bending the brake lines and getting those in place. 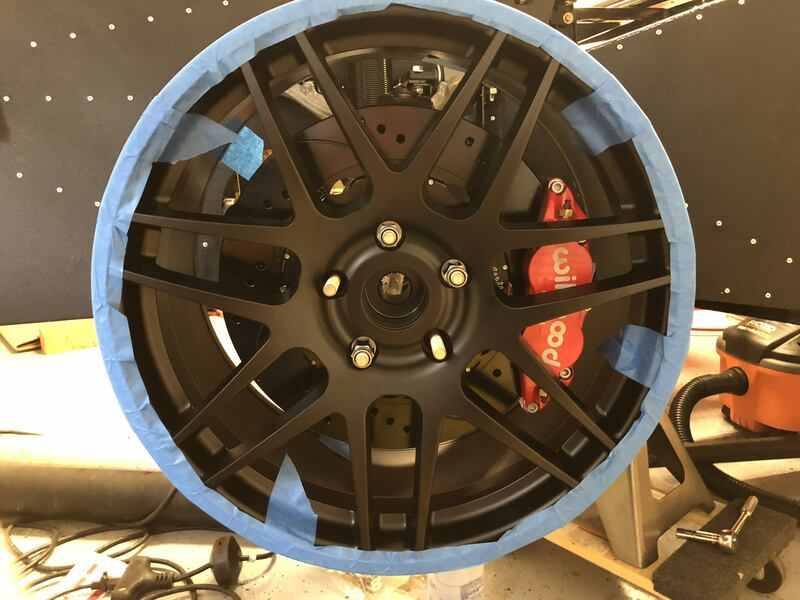 The 20” driver side was pretty easy, although I did do it two times to figure out a nice looking service loop. Then on to the front passenger side. This was a challenge. I picked up some 1/8 rod at Home Depot and basically made a mock up. They only had 36 inch sections, so I cut another to mimic the 60” line in the kit. Took me two attempts, but I am very pleased with the second shot at it. Perfect spacing from the frame all the way around. I looked around for fittings to see if I can put the lines in the front of the MC, but didn’t have much luck so I routed them in the top. Since I will power bleed them from the brakes, I’m not too concerned. The manual is a little confusing to me on the routing of the rear. 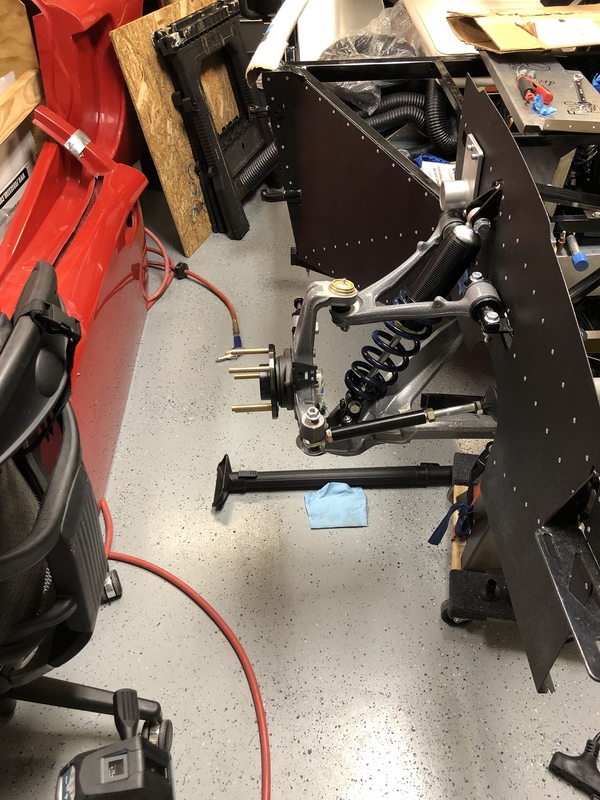 It looks like I need to run them down the driver side of the tunnel, then run the transaxle to the passenger side being I’m running a Mendy Stage 2 setup. Does that sound right? 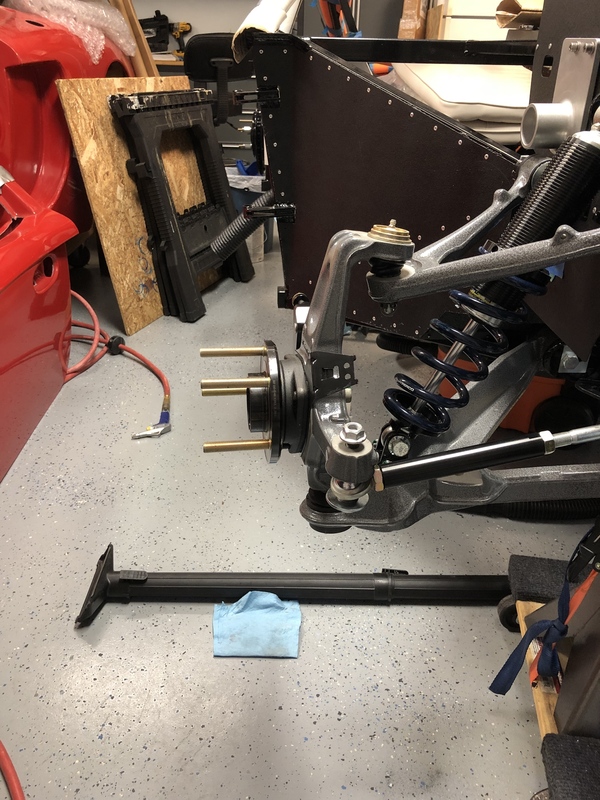 I'd like to at least run the rear brake lines as my Wilwood brakes should be showing up any day now. Unfortunately, I’m still waiting on that to be finished. 14 months and counting. I got my valley cover back from Shane, thank you Sir!!!! I had to cut away some of the webbing under the intake manifold to make room for the boss and the bolt behind it, but she fits perfectly. 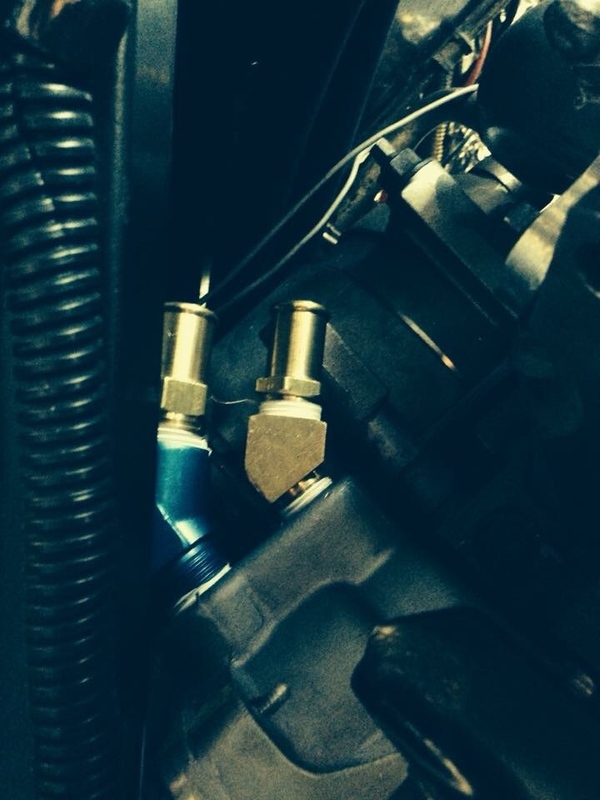 Next step is to modify the inlet and outlet fittings from the water pump. I was given the below pic and have seen others do this, so it seemed to make sense to me. Looking good!! One caution I see looking thru the pics. That steel T brake fitting on top of your brake MC.....expect that to leak. Not sure if we've ended up keeping any of the steel fittings like that because every single one of them has leaked so far. Always end up making a trip to NAPA to get a brass replacement. 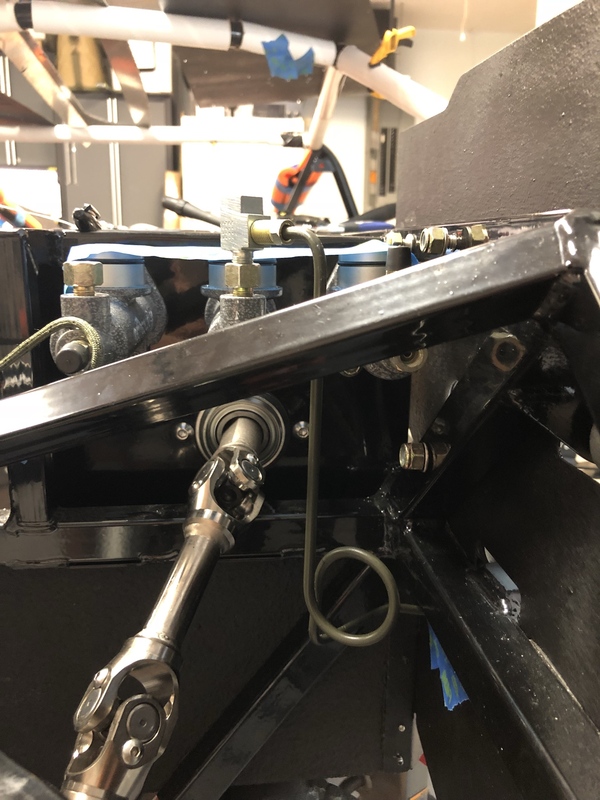 As for the brake and clutch line routing in the tunnel, yes you will need to keep your clutch line to the pass side for the Mendy. Right now, it might seem like you have tons of room in the tunnel, so you can route the brake lines where ever you like. I would try to keep them tucked in as tight to the LH side of the tunnel as possible. 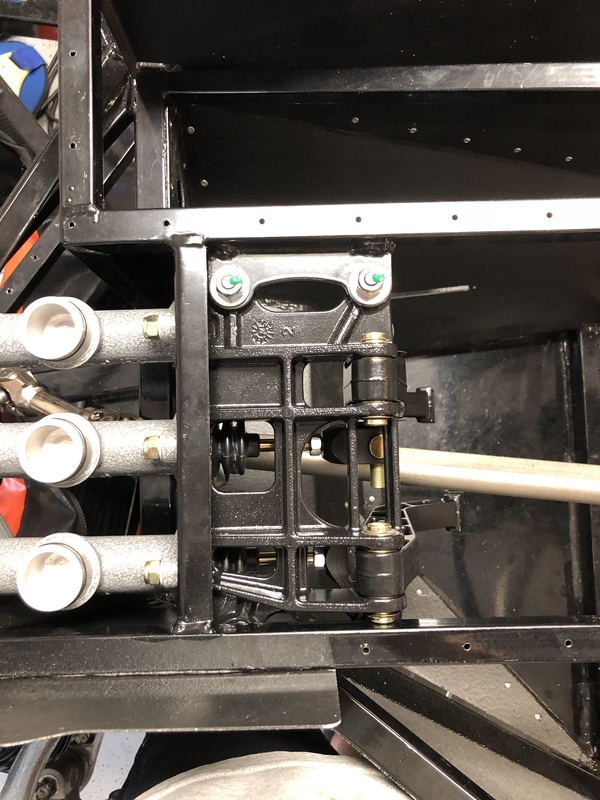 By the time you get your coolant tubes, heater hoses, AC hoses, floor vent ducts, wiring, shift cables, etc...routed thru there, and some insulation for the hot parts, you'll find that you need all the space you can get. 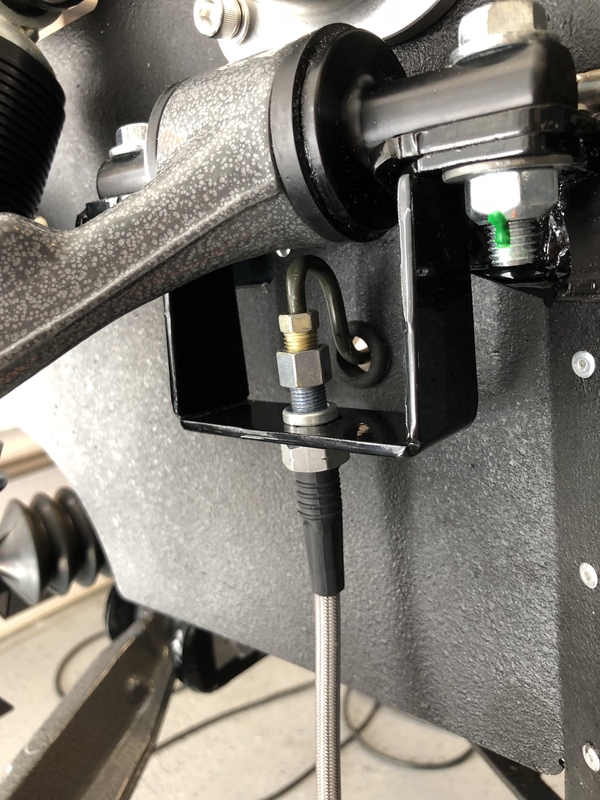 You should be able to route the clutch and brake line together all the way back to the RH side of the engine, so you can secure both lines with a single screw/rivet and some of the smaller brake line clamps. 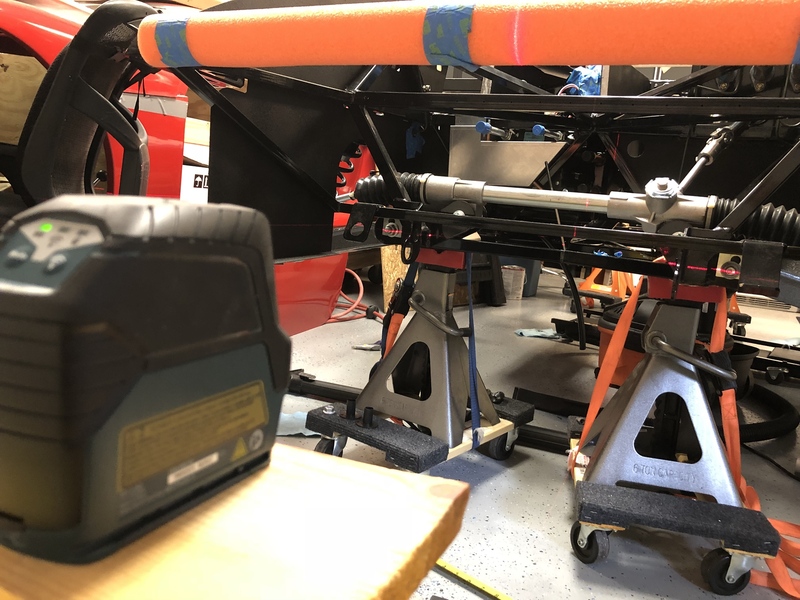 Last edited by VRaptor SpeedWorks, LLC; 09-04-2018 at 08:44 AM. Thanks Shane!!!! Its great having your support along the way between FB, emails, and the forums. Your knowledge and willingness to help guys like me, really helps me along the way. I don’t know if you ordered already, but harbor freight sells a 3cfm vacuum pump for about $150 before coupons that works well for most small to medium sized layups. All you need is to get a few adapters and vacuum hose to convert it from automotive to composite use. 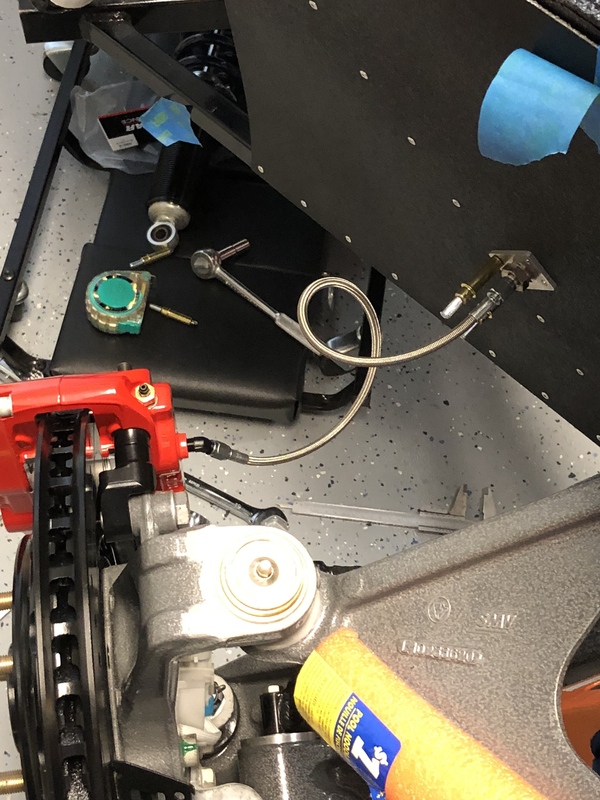 Alternatively, you can buy a venturi pump for about $100 that runs off a shop compressor. When I was on a racing team in college, we used uscomposites.com for most materials not provided by sponsors. You may find them to be a lot more affordable than some of the big name distributors and we never had a problem with quality. If you want to save additional money, don’t buy prepreg. You can make your own at home with a cheap roll of painter’s plastic. Put a layer of plastic down on a flat surface. Put your composite fabric down on top of that. Make sure the plastic is a few inches larger than the fabric on all sides. Pour the resin mix onto the fabric along its center. Put a second sheet of plastic over the fabric/resin. Take a squeegee and work the resin into the fabric, pushing all air bubbles to the edges of the plastic. Now you have homemade prepreg. If you want to really make your parts pop, consider playing with carbon/Kevlar mixed weave. You’ll get a colored Kevlar weave in one direction and the classic black carbon weave in the other direction. It looks sharp when done right. Last edited by Jake From State Farm; 09-04-2018 at 09:09 AM. 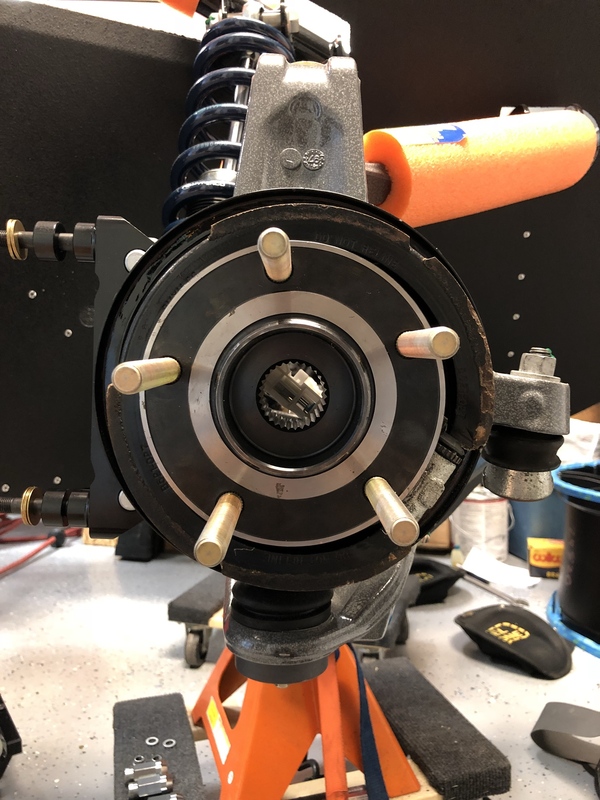 The steel T fittings are the ones we've had the most trouble with....and I don't think it's something that is going to not leak, and then start leaking later on.......they leak right off the bat and in my experience it doesn't matter how tight you torque them, they just keep leaking. After about the 3rd one in a row that we had leak, we don't even install the steel ones anymore to try them....we just automatically replace them with brass. Thanks for the tips Jake. I was able to pick up a nice pump barely used from a guy that made a new hard top for his boat. 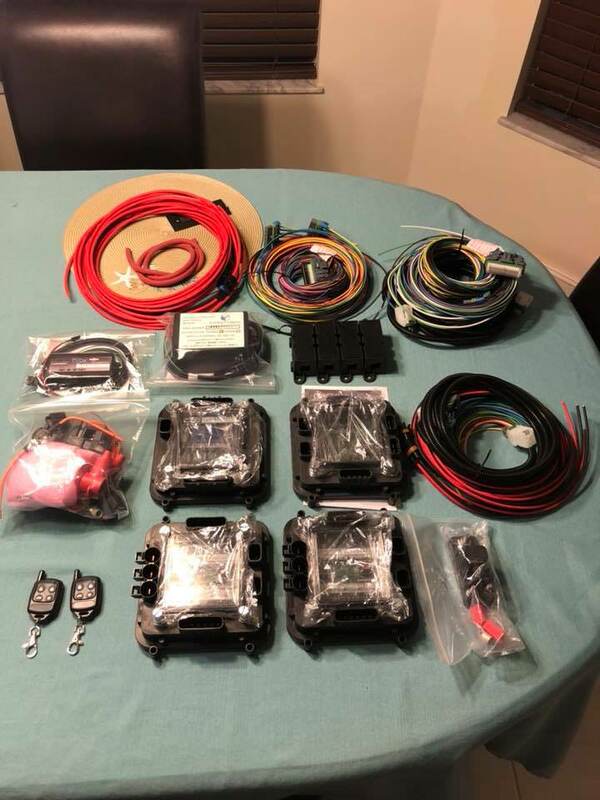 Came with all kinds of fittings, release film, fleece, release wax, various sand papers, ...the list goes on for about $250. So I’m happy on that. I have some thoughts on parts I’d like to either make molds and vacuum bag or simply skin. I’ll find out down the road if I’m crazy or unique in what I choose to do. One thought is take the front fiberglass fender vents I picked up from a guy in Canada that didn’t use them and make my own carbon fiber ones. Same for the roof scoop, but I need to figure out a way to integrate it in the roof that doesn’t look ugly. Who knows, I have a ton of work to do before then so I’ll let the ideas simmer. Practice with fiberglass sheets if you haven’t vacuum bagged before. They’re dirt cheap compared to carbon and they more or less behave the same way depending on the fabric weight and weave type. How are your safety-wire skills?.....those rear hats are lots of fun! We’re about to find out I will say I work at Pratt and Whitney and can have my Engine Assembly Center buddies give me a crash course or give them a 6 pack and have them swing by the house. It would be nice to Bergen cable them, but I’m not investing in that tool. I spent yesterday focusing on the driver side front brake setup and was blown away on how nicely it turned out. Thankfully someone in town had loctite 271, as called out in the Wilwood instructions, for assembling the hat to the rotor. Enjoy!! Looks sharp!! Did you also have to safety-wire them? My .023 Dia. Safety Wire delivery is delay due to the storm in the Carolinas. Supposed to be delivered today or tomorrow, we'll see. 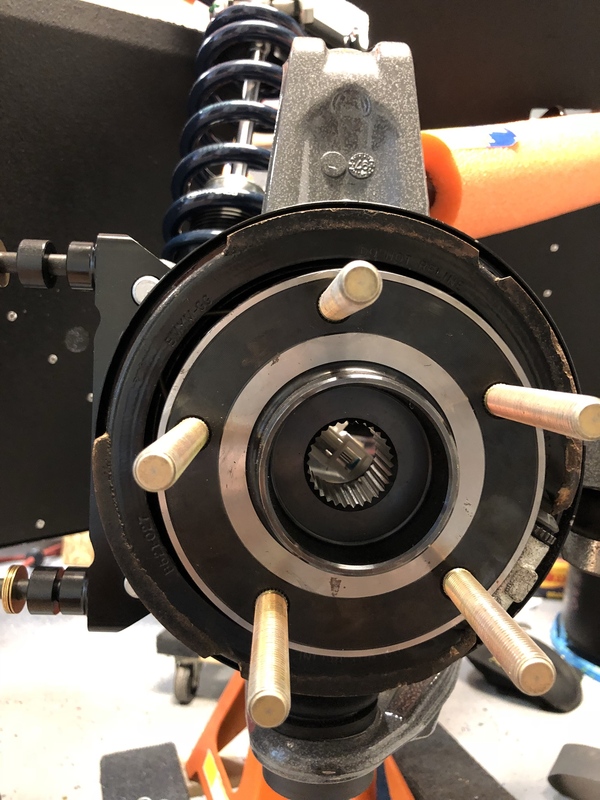 I have all the rotors safety wired up, the rears were fun, and I went to put the rears back on the car for another fit check. I noticed the e-brake pad seems to have a lot of play in either direction that I push it (pic 2 and 3 below, I pushed it left and up and right and down). Is the e-brake pad supposed to be free floating this much behind the rotor? 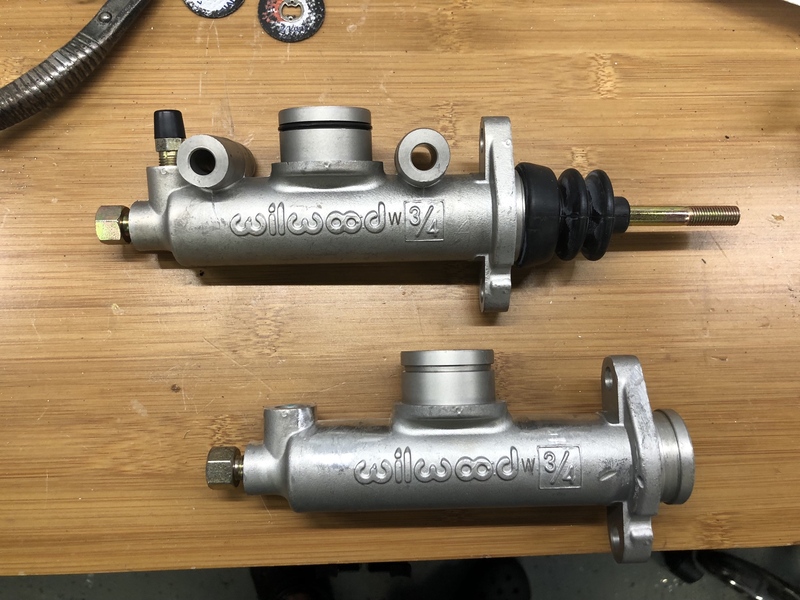 And with the e-brake cylinder (adjustment cylinder) backed off as much as possible I have some rub and resistance when trying to spin the rotor. Is this correct? 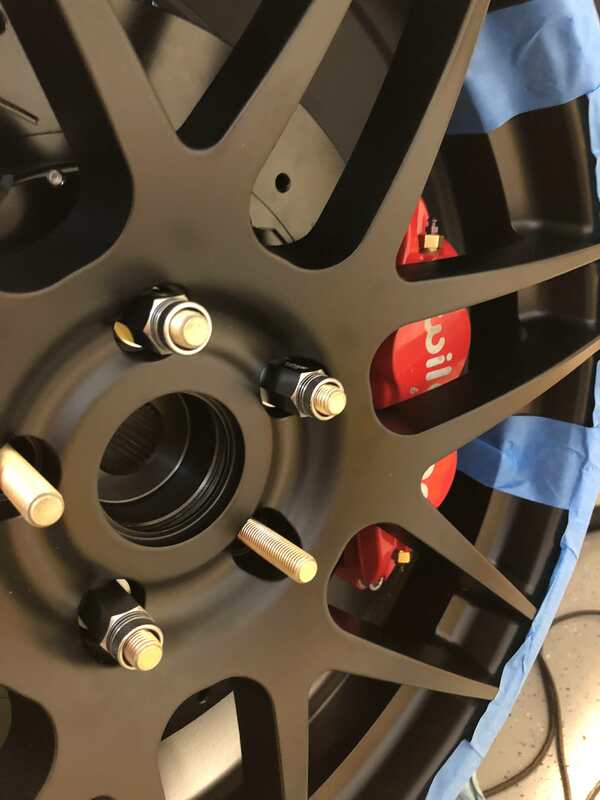 I would say the free movement of the ebrake shoes is normal so they can self-center inside the drum. 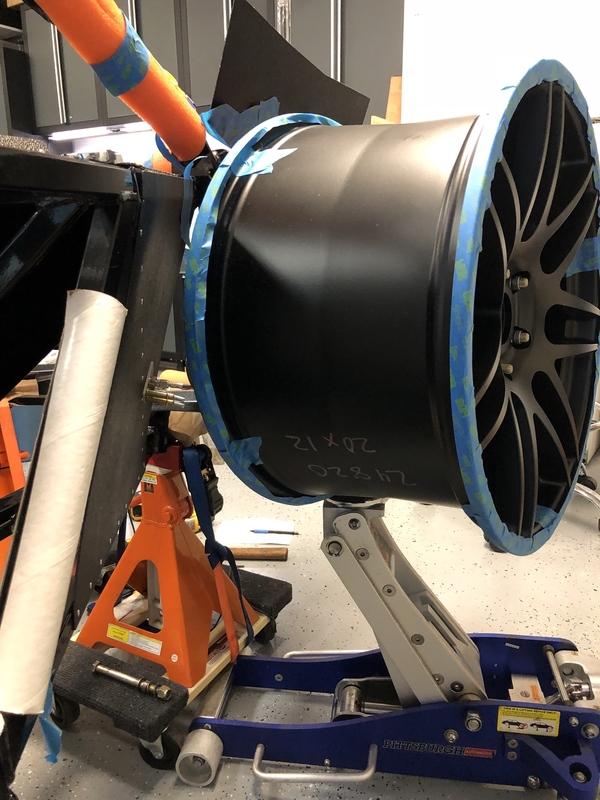 As far as resistance to spinning the rotor, I'd say if it's just a little bit of resistance from the shoe rubbing the drum, that would be ok....but if you're talking about it taking a pretty good amount of force to spin them.....that's not normal. 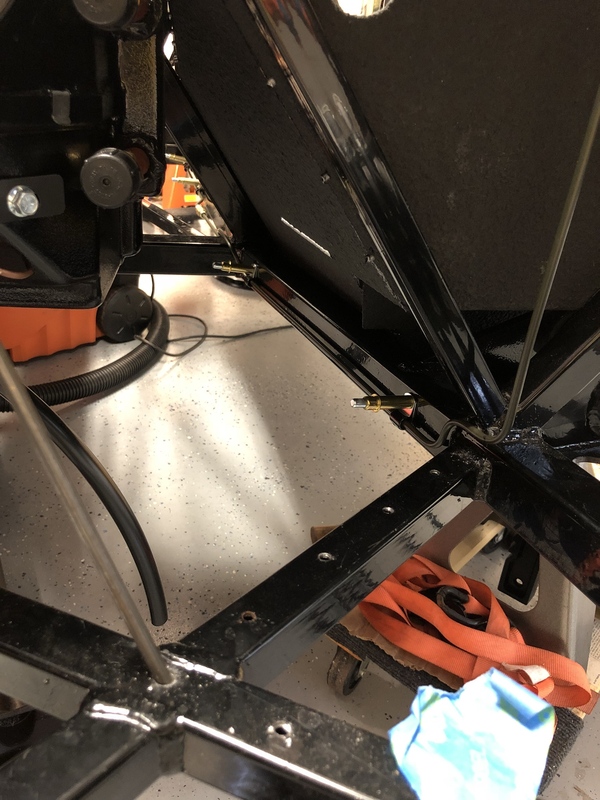 Make sure your ebrake cables aren't hung up and not fully releasing or the adjuster is somehow not seated in the shoe where it needs to be? 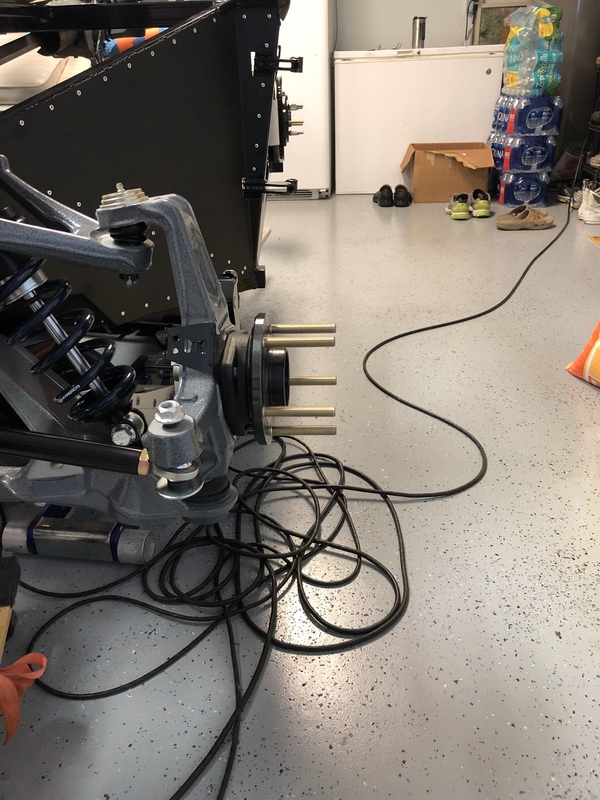 I'm leaving the cables off for the moment while I get the pads installed and adjusted to make sure they are not actuating the cylinder inadvertently. I definitely have something up with the driver side. It would spin nicely, but then seem to get "stuck" and would require more force. I'm going to get new pads and retaining springs and give this another try. Thanks for the input Shane!! I got off work a little early today so I spent some time running the rear brake lines from the master cylinder. I know I'm likely making it more difficult than it has to be, but I love being able to tuck the lines up close to the frame and out of the way. BTW I'm still waiting on my Mendy, and the latest email from Ian was not too promising. 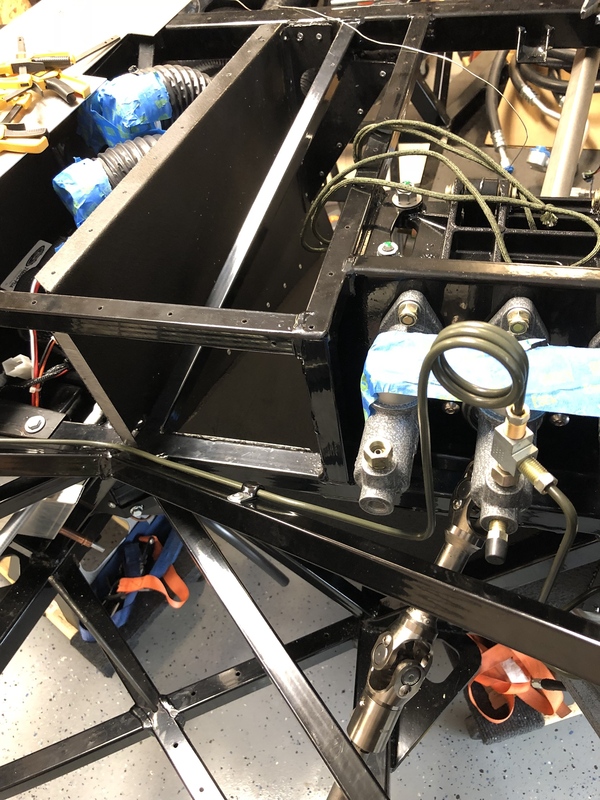 My question is, if running the Mendy transaxle, do you guys run the lines down the driver side of the tunnel and then cross over to the passenger side closer to the engine bay? I'm thinking of running the trans clutch line down into the tunnel on the driver side and then following the cross tube in the bottom of the tunnel starting in the third pic. 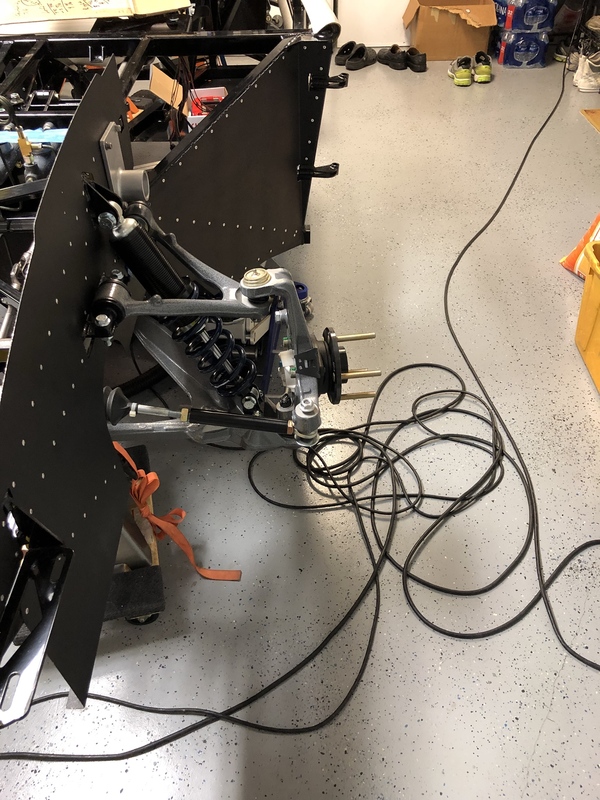 The only bad thing is I don't want to start running those lines until I have the trans to mock up the full length of the run for the clutch line. Beautiful bends! I'd hate to see you cover those up! I know, right . I figure I'll have plenty of items running through the tunnel so any room I can make, the better off I'll be. And you are very right in thinking that way! You'll need all the room you can get. 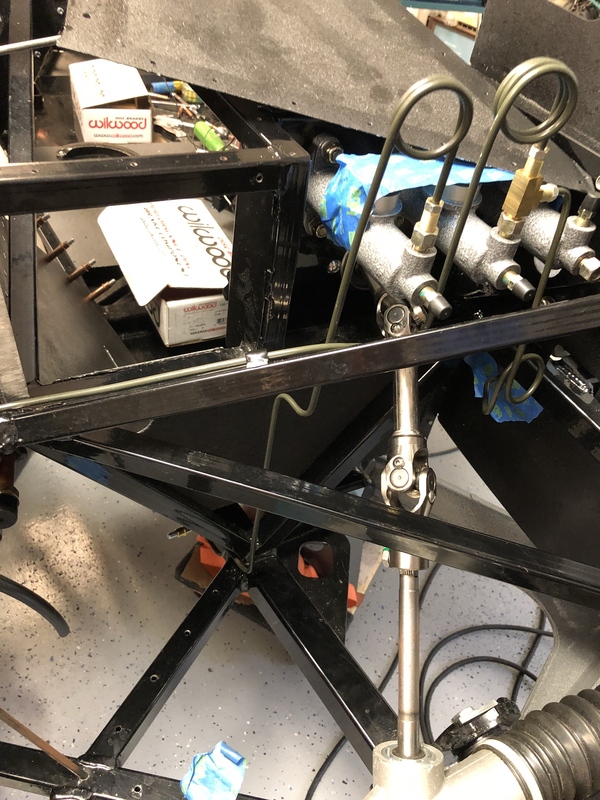 Yes, that short cross tube below the narrowest part of the tunnel is where we normally split the brake lines and also have the clutch line cross over from the driver's side to the pass side for the Mendy clutch. 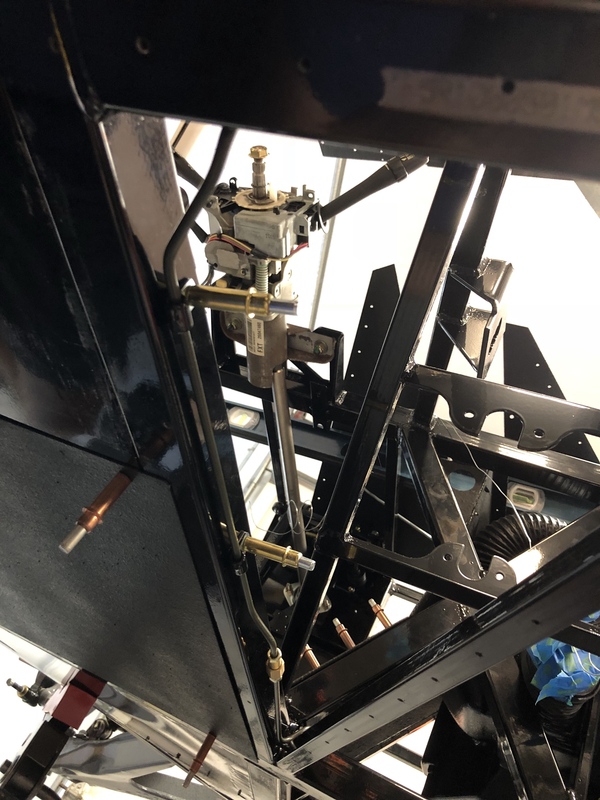 Looking good, I actually took the clutch line and ran it along the cross brace that runs from the drivers side to the passenger side of the tunnel from front to back. 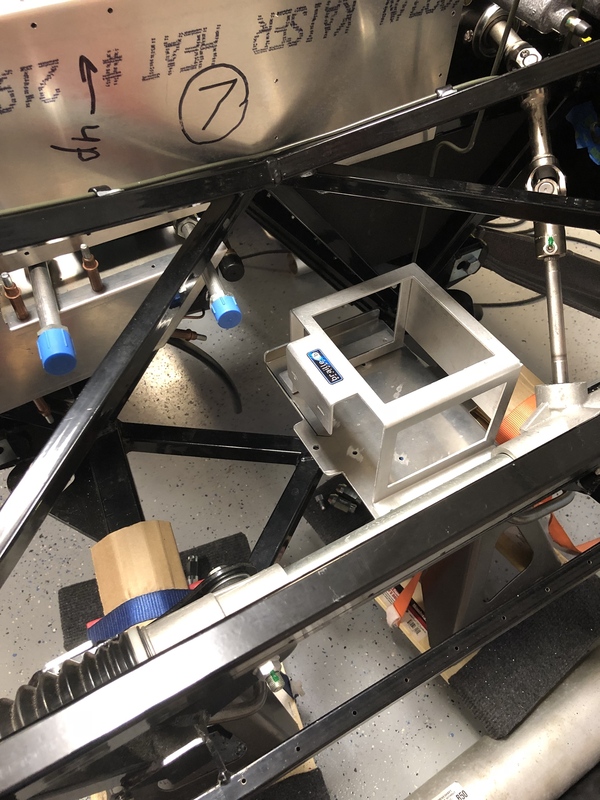 For mine with the Mendy it went to just in front of the passenger side front lower suspension mount. Keep up the good work and good luck with your transaxle. Last edited by SteveE; 10-05-2018 at 10:03 AM. 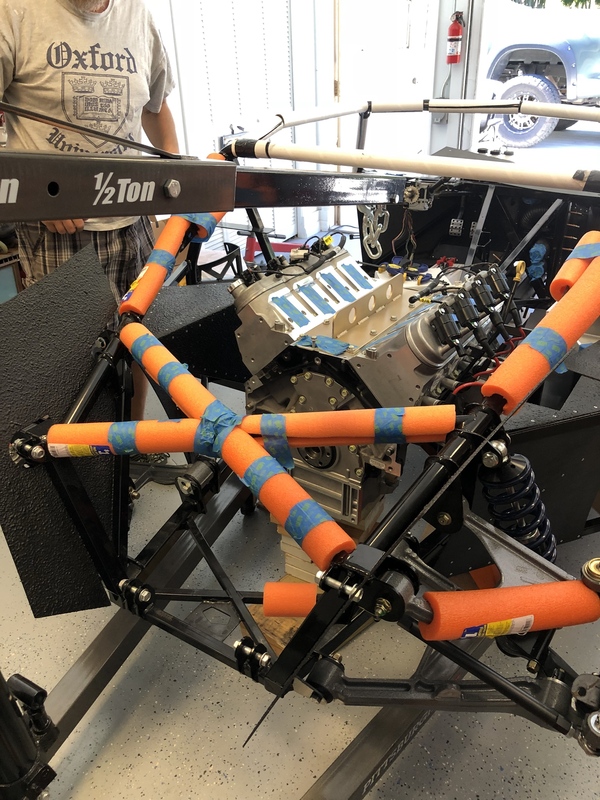 Rear brake lines completely run. Perfect spacing all the way around with not a single point of the lines or fittings touching the frame. That took some time, but the lines are all tucked out of the way making room of other essentials. Plus checked the braided line (18" lines) to the caliper through the suspension travel. All is well so far. 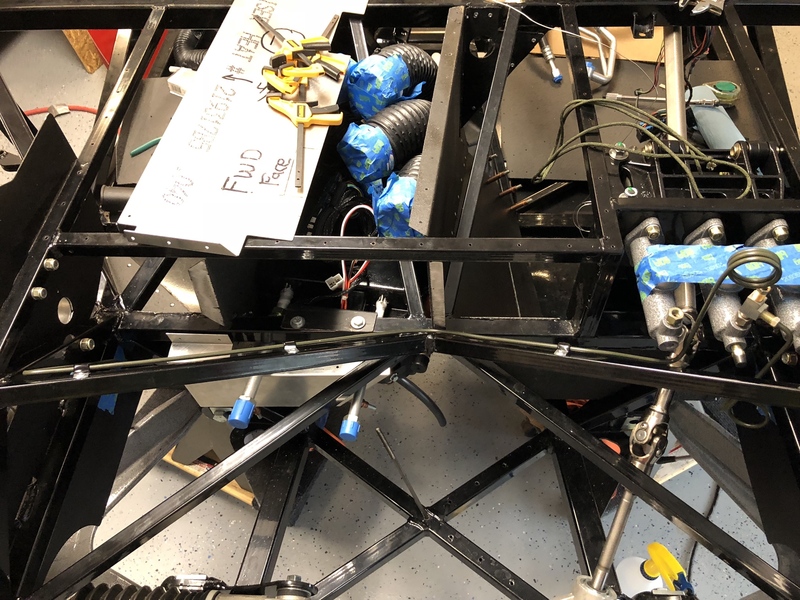 I played around with more suspension and steering today. I installed a rear bump steer kit I just got in and then moved to the front. 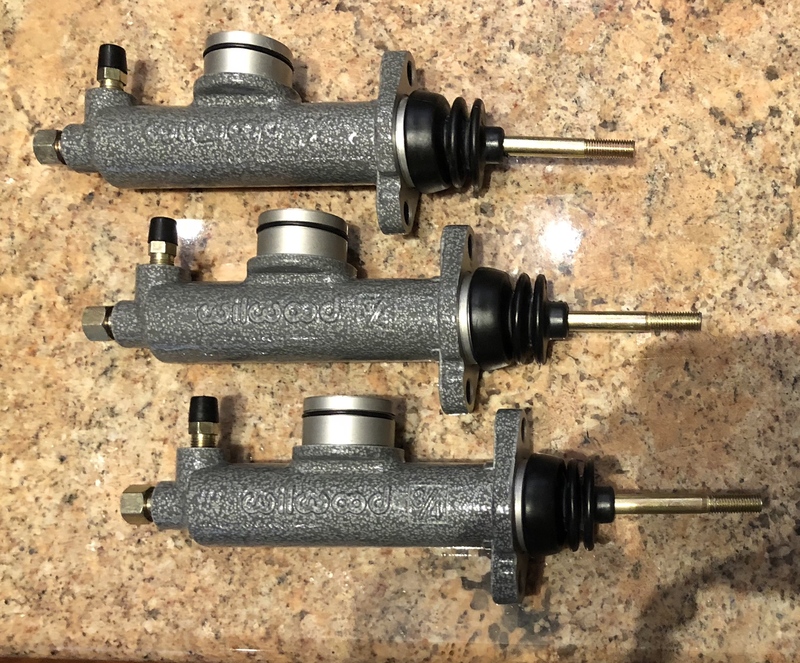 I started to check the front bump steer kit and the travel in both directions on the steering rack. 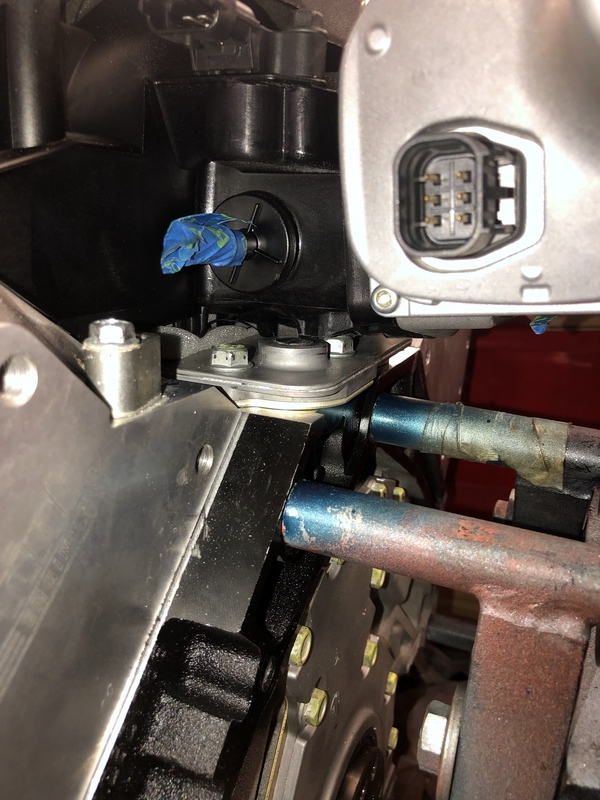 I figured I would need to trim some of the threads off to make it work, but noticed through the travel on the steering rack the driver side seems to stick out more. I figured I would level the frame in the front and take a bunch of measurements before I started cutting. 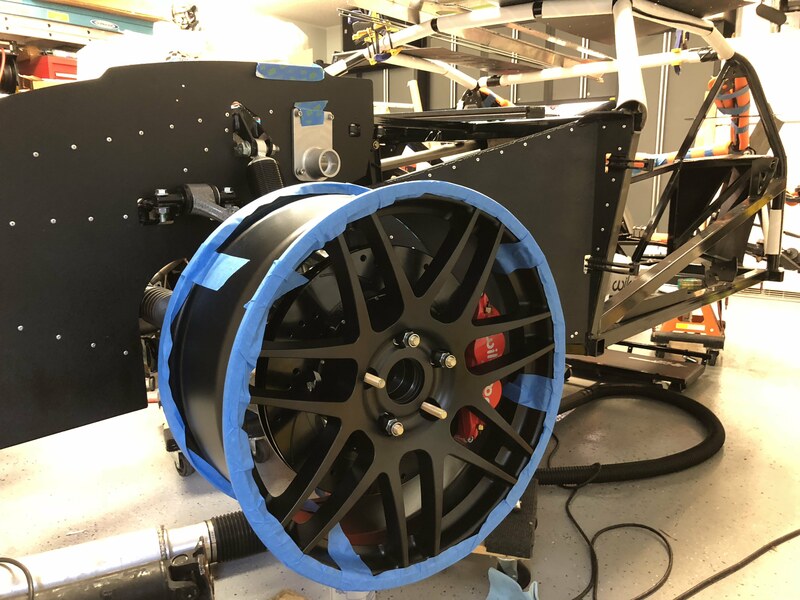 The lower suspension mounts seems like a logical point to start. 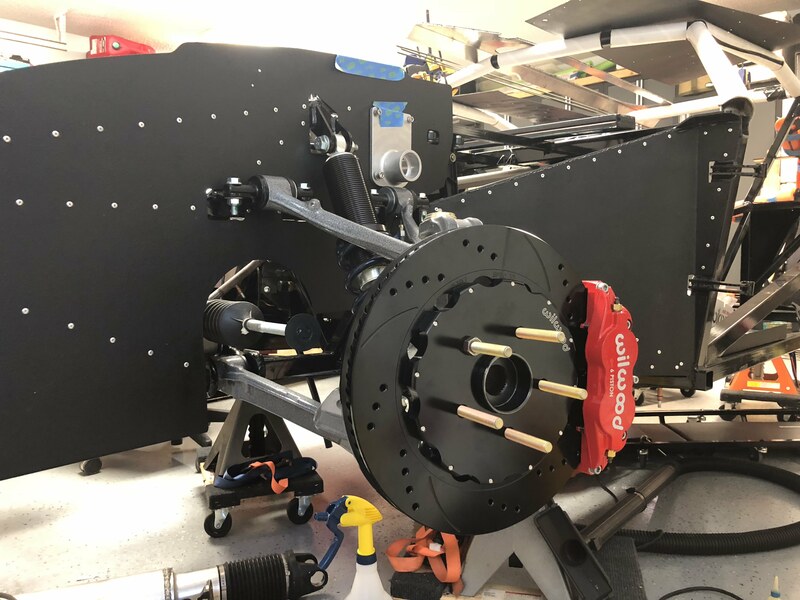 After taking a bunch of measurements, centering the steering rack, threading the bump steer kits all the way in, and then installing in the spindles, here is what it looks like. I guess I'll be trimming more off the driver side, than the passenger by a significant amount. Also, I noticed the threads are the same on both sides of the bump steer kit provided by FFR. It seems counterintuitive to me. 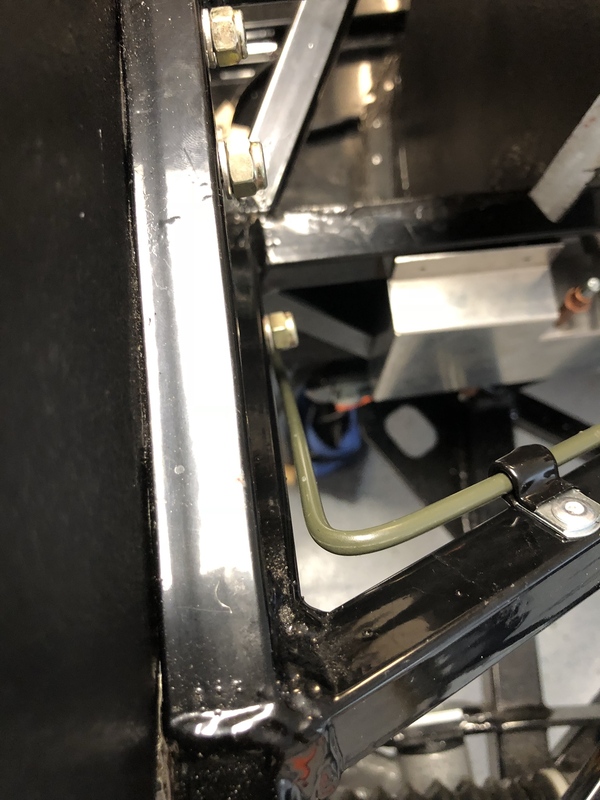 Shouldn't you be able to loosen the jam nuts, rotate the middle black section to get toe in toe out, and then lock it down with the lock nuts to adjust? That seems about right for cutting off the rack threads. You do always have to cut more off of one side. 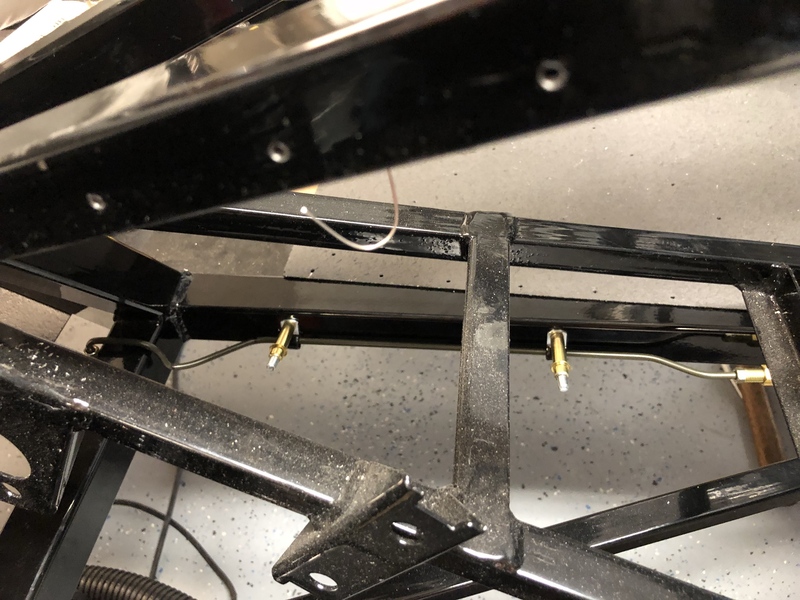 And yes, that is normally the way things work on the "turnbuckle" to adjust toe, but as you noticed, this does not work that way. 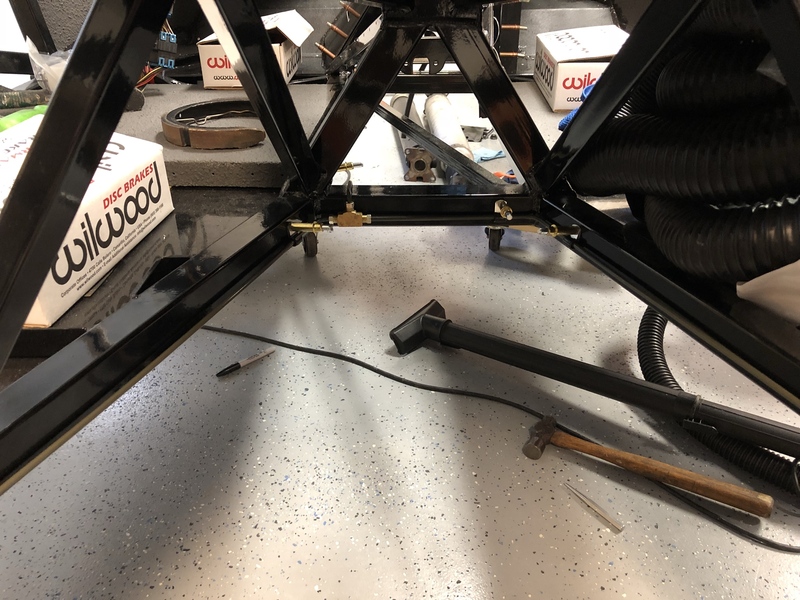 You can lock down the outer nut and then will need to loosen the inner nut and use pliers or vice-grips to rotate the inner tie rod to adjust your toe. Just make sure before you take it in for an alignment, cut the boot clamps on the inner tie rod ends and I normally take some silicone spray lube, break the "bond" between the boot and tie rod end and stuff the spray can straw down in there and give a few sprays of lube so that when the tech is adjusting the inner tie rod end, it's not twisting/tearing the rack boots. I ended up cutting 1/4" off the passenger side and 1" off the driver side today. Now I have a decent starting point. Here is what they look like threaded all the way in on both sides. 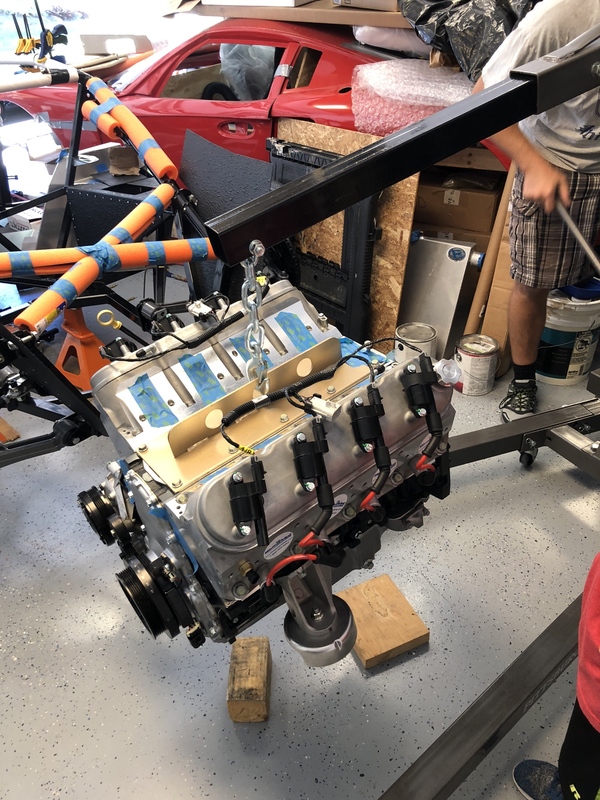 I had my neighbor and his son come over this past weekend and help drop in the LS3 for its first test fit up. We found about 4-5 ways that wouldn't work with my chain hoist and finally opted to use the lift plate that I picked up some time ago. 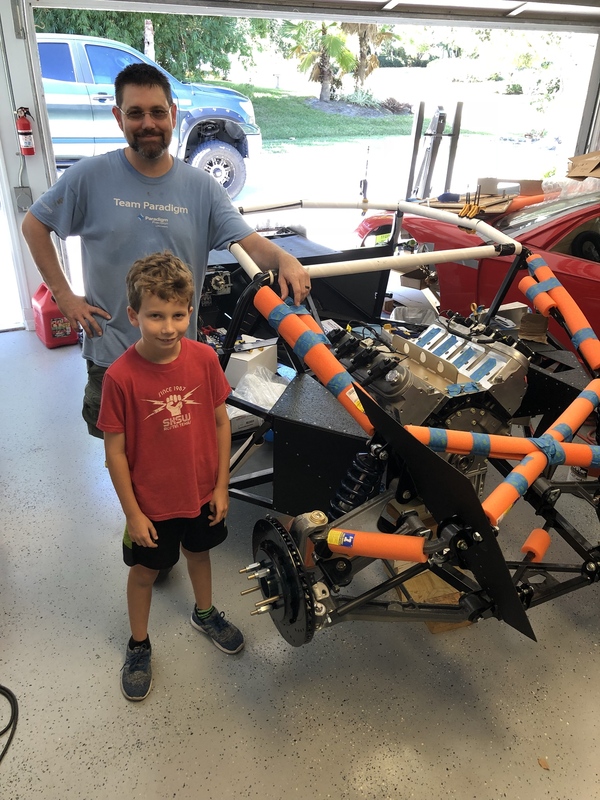 Its really cool having his son over as he has been watching the build since the day my kit was delivered. He is starting to pick up the car lingo and sharing it with his friends on what he his helping out with. I also picked up the Braille battery box holder just to see how I would want to use it. Looks like I can trim the regular battery panel and just mount it in the same spot I was thinking of.